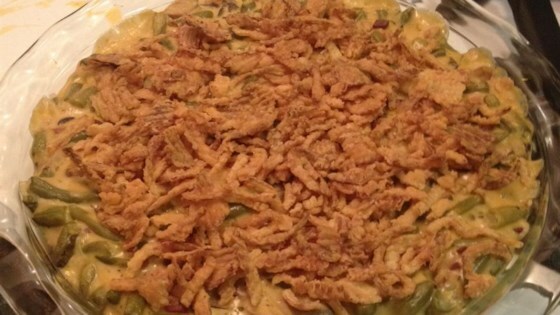 "This is NOT your usual plain green bean casserole. This is a recipe that started with my great-aunt and has been passed around our family for years. People tasting it for the first time ALWAYS want the recipe!" Heat the undiluted cream of mushroom soup in a saucepan over medium heat. Stir in the processed cheese and bacon, and continue stirring until completely melted. Remove from the heat, stir in the mushrooms, then the green beans until evenly coated. Pour the mixture into a casserole dish, and top with the fried onions, leaving a 1 inch margin around the sides. Bake for 25 to 30 minutes in the preheated oven, until heated through and bubbly. Check near the end of cooking to make sure the onions aren't getting too brown. This recipe uses the submitter's substitution in place of a bacon cheese spread, as it is not widely available. If the bacon cheese spread is available, use 1 (5 ounce) jar in place of the processed cheese and bacon in this recipe. Not much flavor. I did use french cut green beans which added a little visual to the recipe. I felt as if this recipe was lacking something. We all ate it but no one was blown away. This was pretty good! I loved the addition of the mushrooms and bacon, but wasn't crazy about the velveeta cheese that I used - I would probably try another cheese the next time. Thanks!